Typical obsessions: Dirt, Germs and Contamination's, Fear of acting on violent or aggressive impulses, feeling overly responsible for the safety of others-for example, unreasonable fear of having run over someone with a car, abhorrent religious (blasphemous) and sexual thoughts, inordinate concern with order, arrangement, or symmetry, inability to discard useless or worn out possessions, etc. Typical Compulsions: Excessive washing (particularly hand washing or bathing ), cleaning, checking and repetitive actions such as touching, counting, arranging and orderly or hoarding. Ritualistic behaviors lessen the chances of distress from obsessions but only short term comfort at the long term cost of frequent ritual repetition. 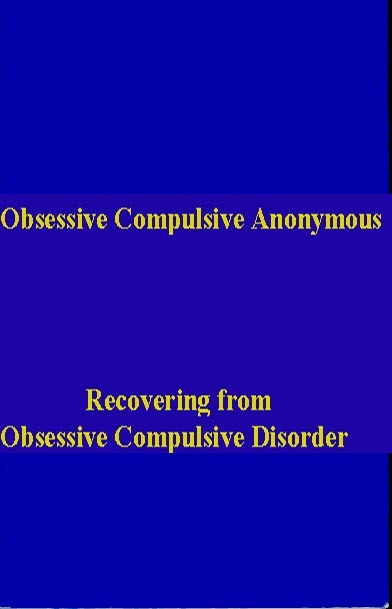 Obsessive Compulsive Anonymous (OCA) Is a fellowship of people who share their Experience, Strength, and Hope with each other that they may solve their common problem and help others to recover from OCD. The only requirement for membership is a desire to recover from OCD. There are no dues or fees, we are self-supporting through our own contributions. OCA is not allied with any sect, denomination, politics, organization or institution, does not wish to engage in any controversy, neither endorses nor opposes any causes. Our primary purpose is to recover from OCD and to help others. We choose to remain anonymous at the public level for several good reasons. Anonymity allows us to share our personal stories, knowing that they will remain in the confidence of those who attend our meetings. Anonymity also reinforces that it is the program not the individual, that is responsible for the recovery. We, as a fellowship , have found that together we can get well when separately we could not. Many of us have spent countless hours 'battling' our obsessions and compulsions, swearing them off forever only to find ourselves right back where we started. There is a solution! The twelve steps, as originated by Alcoholics Anonymous, and adapted for OCA, can bring relief to our common dilemma. Most of us have found, that using this program along with our friends in the meetings can reduce or eliminate our obsessions and compulsions. As the very foundation of our program is one helping another, we ask someone to guide us through the journey of recovery. Sponsors are usually those who have gone before us, and are committed to the practice & principles of the 12 steps in all their affairs. In the OCA program, writing is an individual, personal tool generally used as a means of releasing one's feelings, thoughts, concerns, ideas, etc. rather than acting out on them in unhealthy compulsive ways. Although there are as many methods for implementing this tool as there are OCA members, some common methods include simply using paper and a writing instrument such as a pen or pencil, using a journal, or a writing book or tablet, or using a computer. There are many ways this tool could be incorporated into one's program, including the following; Written assignments, during (12) step or book studies that designate time for writing about the readings, written 10th steps, in "journaling" about personal issues, resentments, fears, etc., creating letters to a Higher Power, or writing letters not meant to be sent, to a person expressing negative emotions or resentful feelings about that person , or a situation. A Comprehended God. A comprehended God is no God at all. - Gerhard Tersteegen Maybe the only thing we know about God is that dependence on Power greater than us brings remarkable changes to our life, and that ultimately those changes are for the best. That may be all we need to know about God. We can guess at other characteristics as we appreciate the grandeur of the universe and the gentleness of people who try to do God's will. But a God that we can pigeonhole wouldn't be much of a Higher Power. God's ways are sometimes simply beyond human understanding. The closest we can come is to equate God with love. If our actions are based on love for one another, we can hardly go wrong. My understanding of God is best reflected in how I treat the people around me. "In God's Care." Service is a many faceted tool, it provides us with the means of freeing ourselves from nagging obsessions, a means of getting out of ones self, of giving back a little to OCA what we have received. Service may be in the form of commitment or volunteering on the spot, such as setting up, cleaning up after, holding an office, leading or speaking at meetings, giving rides, talking to and welcoming newcomers, or putting up OCA fliers. By participating directly in the service of " carrying" the message or aiding in the message being carried to the obsessive/compulsive person who still suffers, we are able to approach the light of the 12th step. Another support of our program, anonymity allows us the complete freedom of expression, on any level of our program, and always assures us of total discretion and confidence of the fellowship. We say: Whom you see here. Whom you hear here. Let it stay HERE , when you leave Here! A commitment to abstinence..... This is a commitment a day at a time to sane & guilt-free behavior. With this commitment (of allowing oneself to sit with the uncomfortable feelings or urges) or action, we are able to find an ease in practicing the principles of step 1. One Day At A Time. ... First Things First. Easy Does It....But, Do It! ... Let It Go. Progress Not Perfection. ... Turn It Over. Too Much Analyzing, Leads to Paralyzing. KISS! (Keep It Simple Sweetie)... Thy Will Be Done, Not Mine! Identify, Don't Compare.... Don't Analyze, Utilize! Act As If! ... Don't Should On Yourself! When I'm in My Own Head, I'm in A Bad Neighborhood.! TAKE What you WANT! & LEAVE the REST! You're Only As Sick As Your Secrets.! TODAY, Is The TOMORROW You Worried About YESTERDAY! LET GO !,,,& LET GOD!........Good Orderly Direction ! Feelings Aren't, Always Facts ! Stinkin Thinkin Leads To Drinkin !...& Stinking Thinking Leads To More Stinking Thinking ! WII-FM = Whats In It For Me? (That radio station, in our head, that we shouldn't listen to! "Religion is for people who fear Hell after death ...Spirituality is for those of us who have been there." JUST FOR TODAY I will try to live through this day only, and not tackle all my problems at once. I can do something for twelve hours that would appall me if I felt that I had to keep it up for a lifetime. JUST FOR TODAY I will be happy. This assumes to be true what Abraham Lincoln said, that "Most folks are as happy as they make up their minds to be." JUST FOR TODAY I will adjust myself to what it is, and not try to adjust everything to my own desires. I will take my "luck" as it comes, and fit myself to it. JUST FOR TODAY I will try to strengthen my mind. I will study. I will learn something useful. I will not be a mental loafer. I will read something that requires effort, thought and concentration. JUST FOR TODAY I will exercise my soul in three ways: I will do somebody a good turn, and not get found out: if anybody knows of it, it will not count. I will do at least two things I don't want to do- just for exercise. I will not show anyone that my feelings are hurt; they may be hurt, but today I will not show it. JUST FOR TODAY I will be agreeable. I will look as well as I can, dress becomingly, keep my voice low, be courteous, criticize not one bit. I won't find fault with anything, nor try to improve or regulate anybody but myself. JUST FOR TODAY I will have a program. I may not follow it exactly, but I will have it. I will save myself from two pests: hurry and indecision. JUST FOR TODAY I will have a quiet half hour all by myself, and relax. During this half hour, sometime, I will try to get a better perspective of my life. JUST FOR TODAY I will be unafraid. Especially I will not be afraid to enjoy what is beautiful, and to believe that as I give to the world, so the world will give to me. "This hung on a plaque in my college room, it still applies." peace there may be in silence. real possession in the changing fortunes of time. disenchantment, it is as perennial as the grass. the stars; you have a right to be here. universe is unfolding as it should. noisy confusion of life, keep peace in your soul.